The Charm Offensive with Debra DiGiovanni! 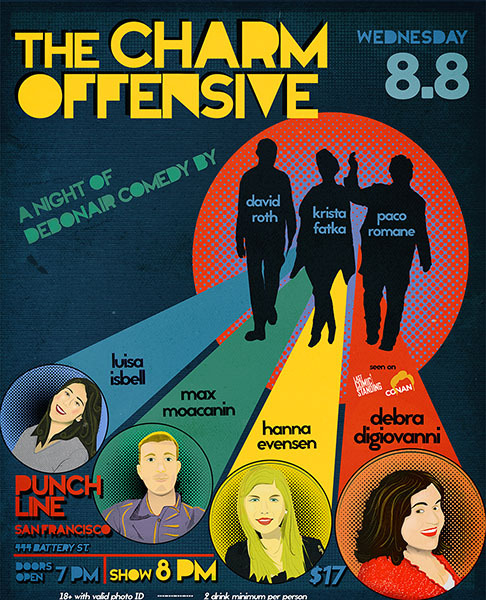 San Francisco’s hit comedy show The Charm Offensive is BACK! Join us for an amazing night of the Bay Area’s most charismatic comedians delivering great jokes, plus national headliners with big time TV credits. From the producers of The Charm Offensive: We keep hearing the name Debra DiGiovanni (Conan, Last Comic Standing)! 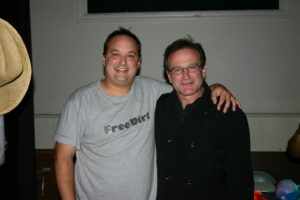 We knew her from Last Comic Standing- she made it pretty far and had great sets. But TV sets always tend to be tame- not to mention usually squeaky clean and super short. Time and again we are hearing from comics and producers in LA and New York that “Debra absolutely destroyed”! Her style is gregarious, mile a minute with an Italian hospitality like your favorite cousin you can never get enough of. She’s fresh off her latest Conan set and at the top of her game. Join us for a raucous night of smart, charming, fall out of your seat funny comedy. The night also features comedians/producers Paco Romane (The Todd Glass Show, Comedy Central, Sup Doc Podcast) and Destiny’s Mom duo Krista Fatka (Sketchfest) and David Roth (Outside Lands Comedy) plus hilarious local comedians Luisa Isbell, Max Moacanin and Hanna Evensen!